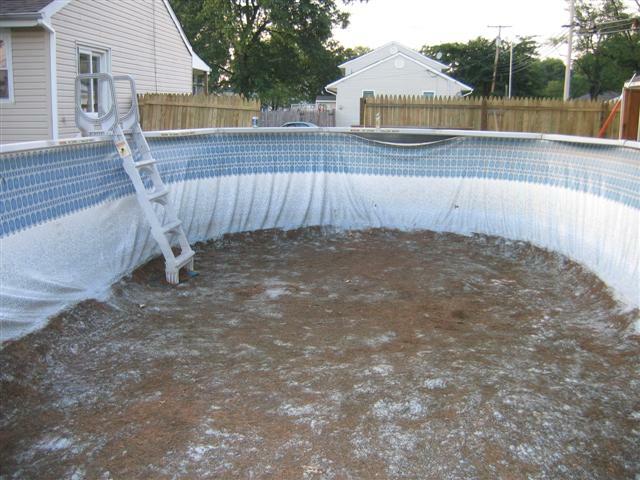 Is your pool liner leaking and you can't find the leak? Tired of endless hours of searching underwater with a foggy swimming mask for that tiny pin hole leak? Tired of getting a nasty sunburn on your back searching for that leak with dye markers and never finding the leak in the liner? We offer electronic leak detection and what may take you hours, days, even weeks to locate, we can find in minutes. Let us save you time and frustration by replacing that leaky old liner with a new one! We deal with all types of liner replacements such as Overlap, Beaded and Uni-Beaded/J hook. 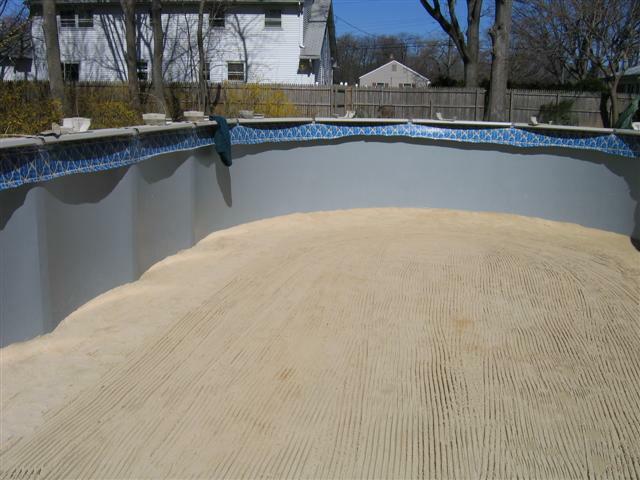 We don't just replace your liner, we resurface the entire pool floor, rebuild the pool cove, and fully inspect the pool for any hidden damage. 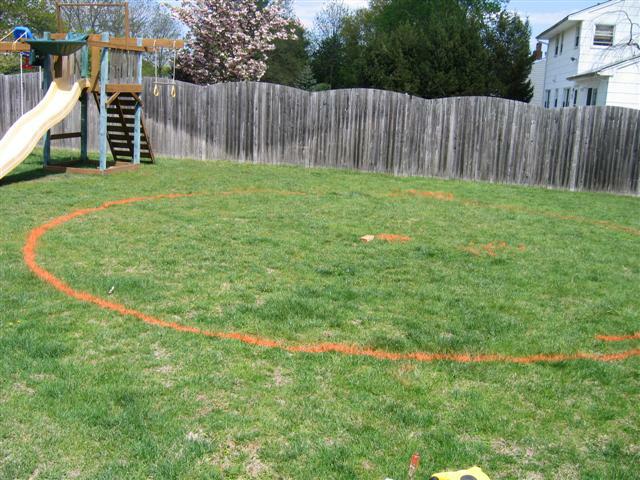 After we are finished you can expect to have many years of trouble free fun! Read below to find out which liner and skimmer you have, so that you can help us help you! How to tell the difference between liners? 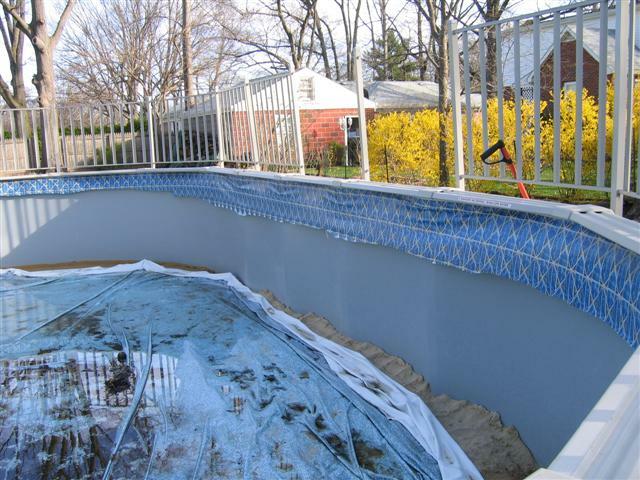 Overlap or over the wall: An overlap liner is installed by overlapping the pool wall and is covered over by coping strips (plastic edging), which may also be covered by the pool rail system and pool ledge itself. In most cases, this liner is visible from the exterior of the pool. The liner is held in place by plastic coping strips. 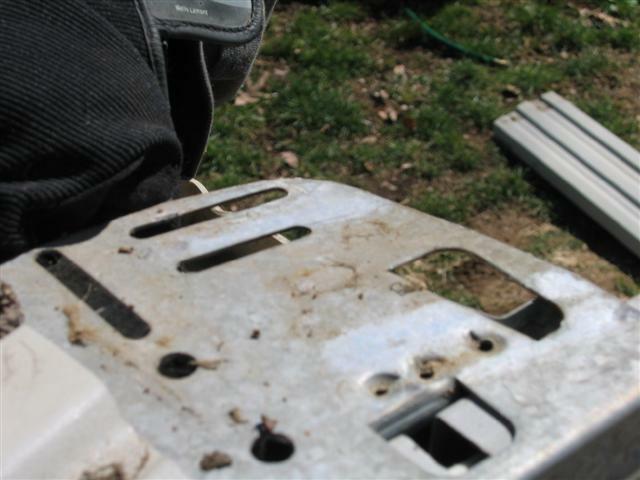 You should always replace these if your old ones are brittle and dry. Beaded Liner: A beaded liner is installed by snapping it into a track or snapping it into a bead receiver channel. This channel may be plastic or metal and is usually covered over by the rail system and pool ledge. The bead receiver is only visible from the inside of the pool. This type of liner in most cases has a uniformed pattern at the water line. 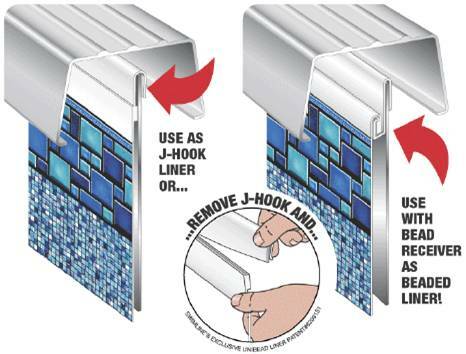 Uni-Bead Liners: A Uni-bead liner is also referred to as “J hook “ liner. Uni-bead liners are installed by slipping the J hook over the top of the pool wall and hanging it straight and securely on the pool. The top rail system then secures the liner to the wall. They will also fit pools with bead receivers. Both Uni-bead and J hook liners are only visible from the inside of the pool. These liners help prevent slippage of the liner, and prevent that unsightly appearance of the liner from outside of the pool. 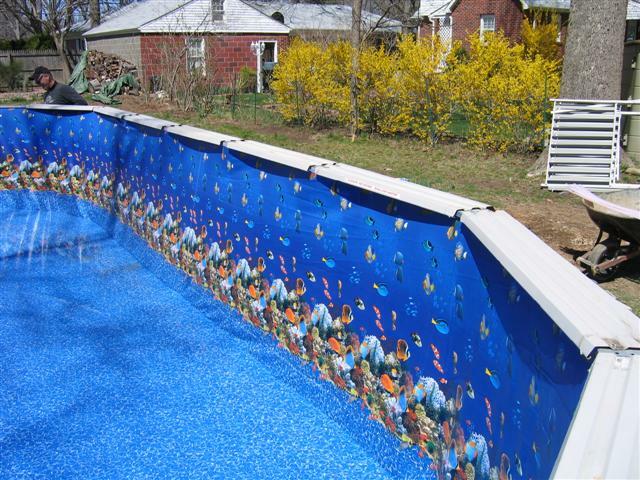 Most pools can utilize the standard bead that is common in the industry. 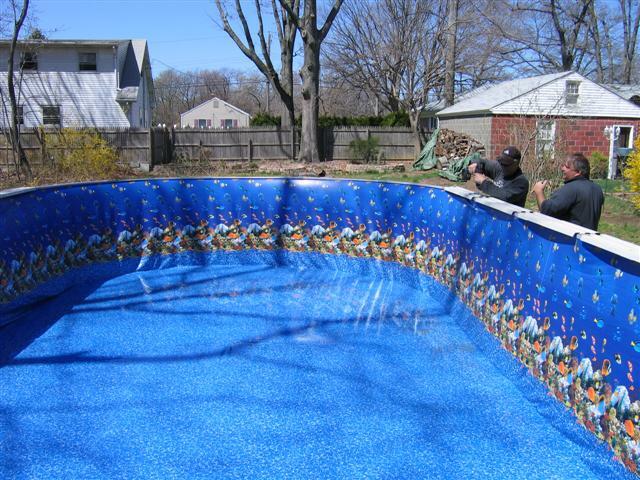 Measuring your pool for a new liner is a simple process. There are generally a few things you need to know so the correct liner can be purchased. First, what is the shape of your above ground pool? Round or Oval? Second, what is the height of your pool wall? The depth of the pool usually ranges from 48" to 54" deep. Third, how is the liner attached to the pool wall? Overlap, Hung Beaded, or J-Hook? On a Round pool, you simply get a measuring tape and take 2 measurements. From inside the pool, you want to measure wall to wall. That will give you the circumference of the pool. The next measurement will be the height. 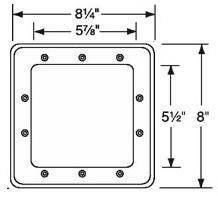 You will measure from the outside down to the metal plate at the bottom. You may have to dig it out a bit as some dirt may be covering the plate. Once you find the plate, from there take your measuring tape and measure right up under the thicker exterior ledges. That will give you the actual height for the pool wall. On an Oval pool you do the same thing as a round except that you do it in the middle of the pool from side to side and at the ends at the longest point from end to end. All measurements are from inside the pool touching the wall at the base. Ready for a new liner? If you are ready to begin your liner replacement please click the link below to fill out a preliminary form to get things moving faster. Once we know some information about your pool we can get to work. *Materials List: Liner, Skimmer, Coping strips or plastic edging (used only with overlap liners), Bead receiver tracks (used only with beaded liners) and Spray adhesive.